Welcome to the shoulder pain, mobility and strength article roundup, where you’ll find all of the content we’ve published on this site since launching in 2017 about the shoulder in 3 categories: pain and injuries, flexibility and mobility and strength. We’ll update this post whenever we publish new articles about the shoulder, so bookmark it as a quick and handy resource in case you have a shoulder issue crop up or want some new ideas of shoulder exercises to do. Often times people complain of pain in the shoulder but have no idea what tissues are affected, making finding the right course of action impossible. In the article I’ll walk you through 4 quick tests you can do to see if it’s your AC joint that’s injured or you have a shoulder impingement. 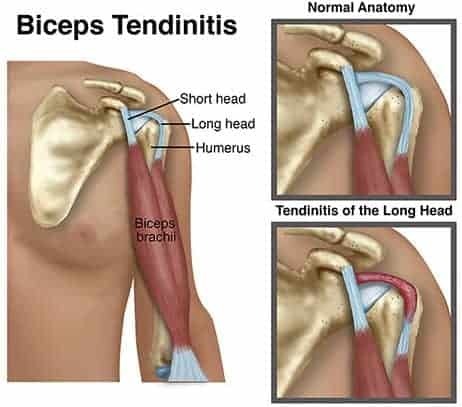 So impingement can lead to bursitis and rotator cuff tendonitis, but what causes impingement? Scapular dyskinesis is an abnormal resting position or abnormal movement of the scapula. Winged scapula is the most well-known issue but others exist and in this article, you’ll get 4 exercises to address various scapular issues. In this section we’ve got a variety of exercises to improve your shoulder flexibility and mobility, from variations on classical stretches to new techniques you likely have never come across before. Do THIS Instead of a Levator Scapulae Stretch for Neck Pain: if your neck muscles ache, you should look at these 3 things so you’re addressing the root cause, not the symptom. The following 4 techniques will all improve your overhead shoulder flexibility and mobility and they’re listed in order of priority if you’ve got issues and from least to most challenging. ERA Sequence for Overhead Shoulder Mobility: this sequence outlines the scientific approach we take at building mobility here at Precision Movement. Prone Alternating Reach Tutorial: trains overhead mobility as well as a concept called reciprocal motion, which is important to train from a neuromuscular perspective. The Arched Hang (do this daily! ): challenging technique for building overhead shoulder mobility and reversing the effects of hunching over at work. If you’ve got no shoulder pain and sufficient mobility, you’re sure to find some new exercises exercises here that will build your shoulder strength in patterns and positions you likely don’t train in. Are Pull Ups Good for Shoulders and Hand Grip Strength? Intuitively it seems yes, but there’s more to it than you might initially think. Technique for Scapular Control & Stability: I love this technique for warmups as it activates the scapular stabilizers and shoulder internal and external rotators. 5 Serratus Anterior Exercises for Healthy Shoulders: the serratus anterior doesn’t get nearly as much love as it deserves so at least a couple of these techniques should be in your routine. 7 Unique Rotator Cuff Strengthening Exercises: the rotator cuff is more than just there to stretch a band out to the side with, which you’ll realize after reading this article and seeing these 7 exercises. 4 Scapular Stabilization Exercises for Rock Solid Shoulders: the scapula is the foundation for the arm so make sure it’s strong and stable with these techniques. 7 Awesome Bear Crawl Exercise Variations: crawling in general is great for adult humans because it simultaneously trains dynamic core stability in multiple planes of motion, the end range of hip flexion, which is critical for squatting deep and the arms and shoulders for stability. Super Drill to Strengthen Your Scapular Stabilizers: this one drill takes you through 4 important positions where you must have strong scapular stabilizers. So there you have 21 articles all dealing with the shoulders with even more exercises to play with. If you found this helpful, I’d appreciate it if you shared this page with anyone who may benefit. To moving freely and without pain!